The information found below can assist you in your decision to become a Friend of the Fisk! Find out how becoming a "Friend" can contribute to the longevity of the arts, ECMAEF and Opus 126. You can also find member giving levels and a membership form. These forms are also available at the Friends of the Fisk table which is displayed at all events in the Concert Season, and below as a PDF. Why become a "Friend of the Fisk"? ﻿There are several benefits of becoming a Friend of the Fisk. First and foremost, all new Friends become part of our “ECMAEF family” that has virtual ownership of this magnificent organ. The East Carolina Musical Arts Education Foundation is a key player in helping St. Paul's Episcopal Church ensure the well-being of Opus 126. The Artistic Director oversees the regular maintenance and tuning that is required and we monitor the environment in which the instrument is housed. We also anticipate long term, scheduled major maintenance and plan our finances accordingly. By becoming one of our Friends, you participate in the care of the Fisk by virtue of your financial support. Our Mission is written in its entirety elsewhere on this website. But for our purpose here, perhaps it can be summarized as endeavoring “to immerse and further educate as many as possible in the beauty of sacred music.” Our programs are arranged accordingly and consist of concerts and workshops designed to educate - as well as entertain - our patrons. Your financial support will help ensure our ability to fund the kind of programs that we plan to bring to Greenville each music season. Opus 126 is the cornerstone of East Carolina University’s sacred music program. 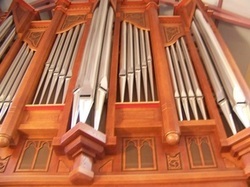 In fact, part of the rationale for building this instrument was to enable students – future church musicians – to learn the complex techniques associated with playing a pipe organ of this caliber. With the training that they receive at ECU, graduates from the music school’s organ studio enter the world of church music with all the skills necessary to begin their careers. We believe that we have a responsibility to continue doing our part to ensure their success. Whilst your financial support does not directly fund these students, it does help to insure the optimal performance of the Fisk. Becoming a Friend of the Fisk places your name on our secure mailing list, thus enabling us to keep you fully informed about the musical events that we are planning. You will be among the first to learn of next season’s programs which will include special receptions just for our Friends, and special seating at select concerts. The East Carolina Musical Arts Education Foundation is a 501(c) 3 not for profit organization. Therefore all contributions are fully tax deductible on the donor’s tax return. Thus our Friends receive a financial benefit for helping to continue our programs and ensure the longevity of the Fisk. We are grateful to all who have joined our Friends of the Fisk program; we hope that you, too, will become a member, and thank you! Become a "Friend of the Fisk" today! To join the Friends of the Fisk, please print our membership form (PDF) or the image of it below, complete it, and mail it to the address below with your contribution. Please make checks payable to ECMAEF.